I just came out of watching the film “Warsaw 44″, a film about the Warsaw Uprising of August – October, 1944, a 63 day insurgency that ended in tragedy for the Polish resistance. Warsaw 1944, if you like, in many ways, is Gaza 2014. It took place at a time when Soviet troops, moving from the East where they had, since the Battle of Stalingrad, consistently push back the Nazi war machine towards Germany. Sitting next to me in the theater was a woman who had come down from Wyoming. Originally from Poland, her husband had fought in the uprising, survived, died a few years ago. Tears were streaming down her eyes most of the movie. The uprising took place as Soviet troops were approaching Warsaw and Nazi troops were retreating west towards Germany. The purpose of the uprising was to present the liberating Soviet armies with the Polish national forces representing a future legitimate Polish government that Moscow would have to recognize and thus deal with in the post-war situation, but Stalin had other ideas. Understanding the political consequences, and reneging on promises to help liberate the city in cooperation with Polish resistance forces, Stalin’s armies stopped at the doors of Warsaw and let the Nazis utterly destroy the uprising. . Sixteen thousand Polish resisters were killed and some 6000 badly wounded. As many as 200,000 Polish civilians died, mostly from mass executions which followed; Nazi casualties numbered 8000 killed and missing, 9000 wounded. The city was obliterated for all practical purposes. More than a quarter of the buildings in Warsaw were destroyed at that time. Combined with the initial September 1939 Nazi offensive and the Warsaw Ghetto Uprising of 1943, all told, at the war’s end 85% of the city of Warsaw had been destroyed. The movie itself is about a band of very young civilians who join the national cause without any sense whatsoever of what it is to go to war beyond a strong sense of national patriotism (in the wholesome sense of the term). Although dealing with the previous European carnage, World War One, theme-wise, Warsaw-44 is in some ways similar to another contemporary film, the British film, Testament of Youth, based on the work of British pacificist, Vera Brittain. In both movies, idealistic, completely untrained youth are unprepared for what follows. But then before the shooting starts, who understands what the horror of war will mean in practice? Warsaw-44 basically documents the horror that these young participants in the uprising experienced and suffered, the sacrifices they made and the suffering that people of Warsaw endured in those agonizing days. Very few survived. 1944 – so long ago and far away for most of us, including Poles, and yet a good dose of modern Polish nationalism is based upon the sacrifices made those 70 years past. Thus all over the world, including in Colorado, Polish emigres, ex-pats mark the occasion, again and again and again. Warsaw 44 is the kind of film that couldn’t be shown until recently in large measure because during Poland’s Communist-controlled period (1945-1991) it wasn’t permitted as it showed the Soviet military in a poor and opportunistic (to put it mildly) light. Although the main prosecutors of the massacre was the Nazi military, Stalin’s halting of the Soviet offensive at Warsaw’s gates amounted to nothing less than a cowardly, vicious policy that Stalin pursued at the time for political reasons to wait at Warsaw’s gates while Nazi’s finished off – or at least severely mauled – the Polish Home Army and the Polish Committee of National Liberation defending the city. Before viewing, I had a pretty good idea what this film was going to be like; it was going to be very painful to watch. There are parts of it that had me in tears, which doesn’t happen very often. The description of the utter agony that was this uprising…it was, unfortunately, very, very well done. That said, I’m glad I saw it. It reminds me of many things, but mostly it reminds me what it was that the people of Poland suffered at the hands of the Nazis, and that if Hitler’s first goal was to exterminate the country’s Jews, exterminating Slavic peoples, Poles first among them, were next on the list. The film struck quite the chord in Poland itself where it broke the box office record for 2014 with 1.24 million tickets sold during the movie’s first 21 days on release, outselling international blockbusters playing in Poland at the time (Wolf of Wall Street, Transformers 4). 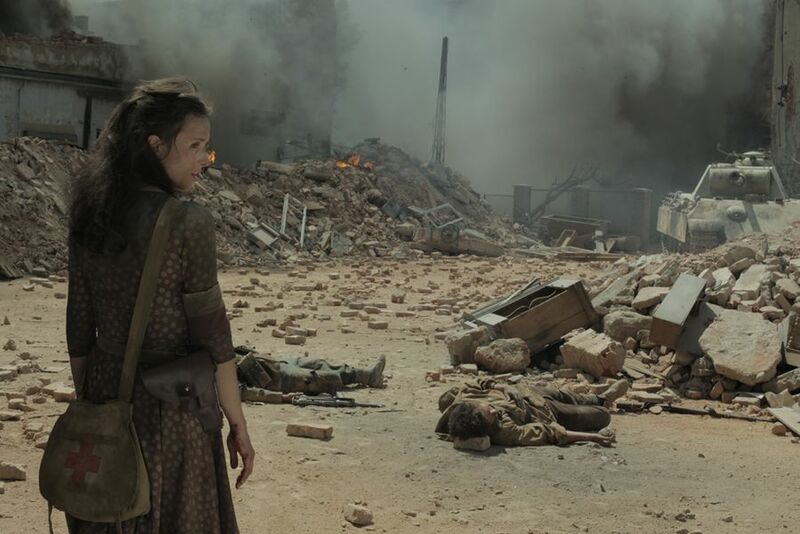 One has to distinguish the above Warsaw Uprising described in this film from the Warsaw Ghetto Uprising which started 16 months prior, on April 19, 1943.It was crushed in a similarly cruel, savage fashion. At that time, what remained of the city’s Jewish population was all but exterminated.